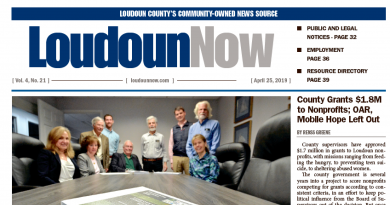 Editor: Headlines about the county’s proposed 2040 comprehensive plan illustrate the intense focus on how much, and where, Loudoun will grow. There is no doubt the county must figure out how to accommodate more housing and data centers. But land use planning encompasses more than just buildings and roads. It starts with identifying and preserving the irreplaceable network of natural assets- streams, meadows, forests, wetlands, mountainsides and limestone- that are needed to sustain Loudoun for generations to come. Does the plan adequately address Loudoun’s carrying capacity? In other words, how many people can be supported, without degradation to the streams and limestone areas that provide clean drinking water? Are the policies detailed enough to conserve sufficient forests and vegetation to filter the air that we breathe, and absorb impacts from droughts and floods? Rooftops and roadways are made of impenetrable materials that cannot absorb rainwater like natural lands do. The stormwater runoff from those impervious surfaces degrades water quality, and increases the quantity of polluted water that runs into streams. Water quality begins to suffer before the amount of impervious surface even reaches 5 percent in a watershed. Large amounts of impervious surfaces, such as those associated with data centers, can even increase the size of a floodplain, so care must be taken to plan for future cumulative impacts of residential and commercial growth. This should include guidelines for appropriate locations for data centers, tree canopy goals, impervious surface goals, and policies for increased stream buffers and use of native plants along streams and roadways. The new comprehensive plan must balance growth with conservation. Unfortunately, the new draft plan weakens many of the current plan’s existing natural asset policies. The final plan must bolster protections for Loudoun’s natural infrastructure, in order to sustain a high quality of life now, and for future generations. Supervisor Higgins is disingenuous when it comes to preserving Loudoun. He has supported and/or allowed for: 1. The re-zoning of the land at the Point of Rocks Bridge to accommodate a mega gas station (attorney Minchew by his side); 2. The re-zoning of land to allow for a commercial, non-conforming building to expand for a second time (here, he wants the county to chip in almost $50,000 to pay for re-zoning costs, with Minchew by his side); 3. He supports the widening of Rte. 15 now, so it can move towards becoming a major highway (see the Comp Plan); and 4. He has advocated to destroy the alley and road network in Waterford, a character defining feature of a rural, colonial village, established in 1801. He is no friend of conservation but says he is. Folks like Higgins and Minchew are part of the problem. This is an age old argument from the environmental community. This was already a big argument during the Chesapeake Bay Preservation Act debacle. For starters, new developments in the transition area or rural county have pretty high open space requirements (50% minimum). Nobody is talking about paving 90% of the land like it’s done out east. And I’m pretty sure the county now requires any new large developments with a lot of impervious surfaces to have retention basins incorporated in the designs. You see them everywhere nowadays. They are designed to catch stormwater runoff so it doesn’t flow straight to our watershed, allowing sediments and potential chemicals to deposit at the bottom. When the basin fills up, the excess water overflows and doesn’t drag all the sediments with it. Of all the arguments against development, this is probably the weakest one.